Today, most digital media usage originates from mobile devices. People interact with their apps using multiple devices, over a variety of connections (3G, LTE, Wi-Fi, and so on), as well as offline. It’s important to offer a consistent user experience across different connection types. At the same time, there’s been a rise in the number of social media apps and apps that incorporate social elements to enable activities like collaboration, messaging, and commenting. These activities require a real-time capability to automatically present updated information to users. AWS AppSync, introduced at re:Invent 2017, is a fully managed GraphQL service. It makes it easy to build collaborative mobile and web applications that deliver responsive user experiences, and provide offline and real-time capabilities. You can find more information about GraphQL in the AWS AppSync Developer Guide. Today, we’re introducing ChatQL, which is a new Angular Progressive Web App (PWA) starter application. 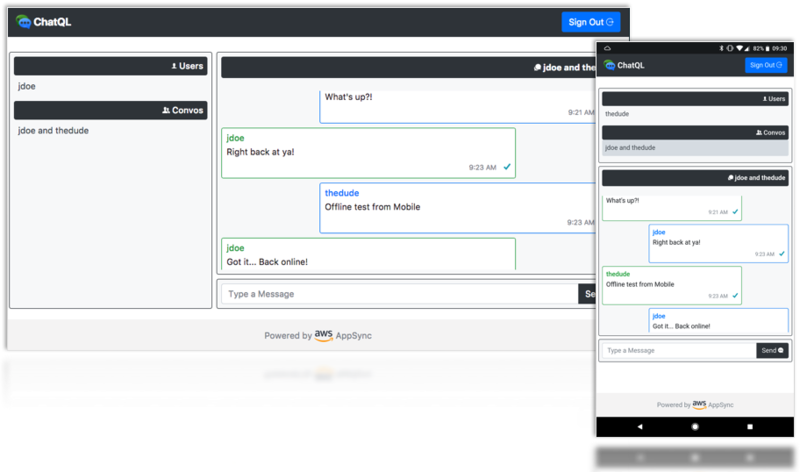 Built with AWS AppSync, it showcases how to create a real-time chat application. In this blog post, we present an overview of the application, and dive into AWS AppSync and the front-end implementation. You can clone, install, test, build, and deploy ChatQL by following the instructions on the GitHub respository. You can automatically configure and deploy the User Sign-In, Analytics, and Hosting backend and related AWS services by using a few AWS Mobile Command Line Interface (CLI) commands. The following graph is a high-level representation of our data model. It’s composed of nodes and edges. Along the edges, cardinality information for each connected set of nodes is presented. The nodes represent the data that we’re storing, and the edges represent associations between the data. The graph view helps us understand how the data relates to itself and how it should be stored. Note that we’re storing the data in DynamoDB. A GraphQL application doesn’t require using a graph database. The chat application consists of a “chat-app” feature module that’s composed of several components. Each component interacts with the module’s simple Angular service that provides access to the AWS AppSync client. Users must authenticate to use ChatQL. AWS AppSync allows you to secure and protect your data by using API keys, AWS IAM or Amazon Cognito user pools. 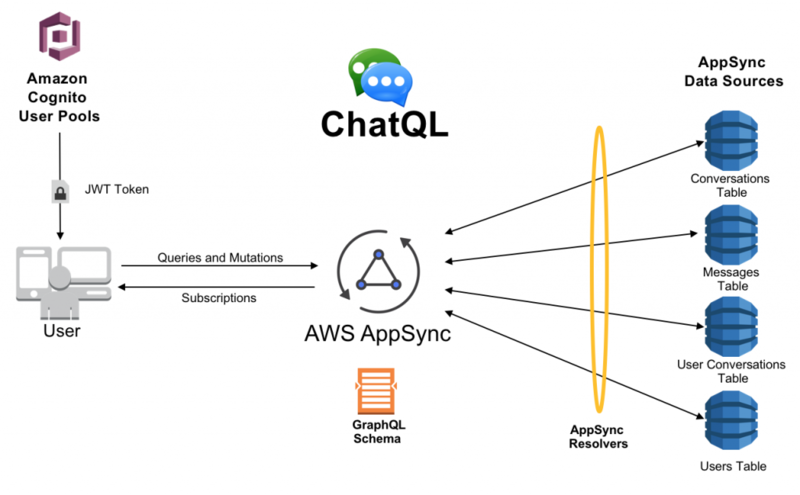 The ChatQL application uses Amazon Cognito user pools, and allows users to register their account and sign in. After successful authentication, Amazon Cognito returns a JWT token to the application that’s used to identify the user and authorize access to the AWS AppSync GraphQL API. ChatQL uses the AWS Amplify library to easily implement authentication. AWS Amplify is a declarative library that makes it easy to implement common tasks (such as authentication) in front-end and mobile applications. A thin stand-alone feature module implements the onboarding pages for the app — calling Amplify Auth for sign-up, sign-in, password confirmation and sign-out. You make this module available in the application by adding it to imports in app.module.ts. The query returns a MessageConnection type, which is a GraphQL connection. A connection is a term that describes paginated data. It allows us to efficiently query for a subset of messages. A connection is typically composed of an array of data (the paginated field) and a token/cursor that points to where the next query should start from. We use a “cache-and-network” fetch policy in watchQuery to retrieve the messages. This way, simultaneous requests are made to the client cache and to the backend for messages. This allows a quick response to the user if a list of messages is already in the cache. The cache is then updated by any new messages that are returned from the network. We subscribe to the observable object that watchQuery returns to update our message list, and store the returned nextToken. When it opens an existing conversation, the application only loads the last 10 messages. A conversation can hold any amount of messages. We don’t want to retrieve all of them at once because this would impact the application’s responsiveness. 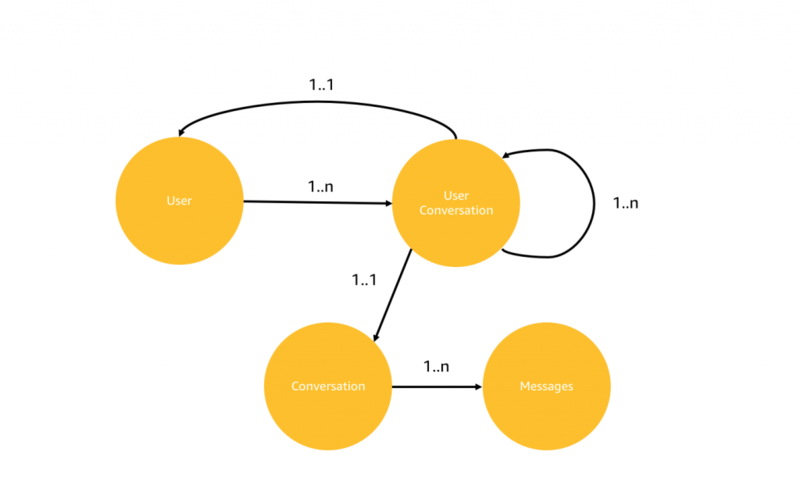 The application uses the allMessageConnection query with the first argument to manage how messages are fetched in batches. The nextToken saved from the previous query execution is used to specify where message retrieval should start from. Additional messages are loaded by scrolling up in the message view. The scroll action triggers an event that calls loadMoreMessages in chat-message-view.component.ts. We call fetchMore on the original observable object with nextToken, and append the new set of returned messages to our existing list. This allows a seamless infinite scrolling experience for the end user. During a conversation, the application pushes new messages in real time to the chat. AWS AppSync provides this functionality with subscriptions. We subscribe to new messages in the current conversation, and a subscription is invoked any time a message is created. To do this, we call the subscribeToMore function on the observable object that’s returned by the watchQuery function. We pass the ID of the current conversation to the subscription and add newly received messages to the front of our existing message list when a message is pushed to our chat app. To update our backend with GraphQL, we use mutations. The app uses a createMessage mutation to add a message to a conversation. However, GraphQL operations aren’t possible when the backend can’t be reached. This limits the effectiveness of a typical app. To send a message, first we construct a message object. We define the ID of the message on the client side. We do this so that we can properly roll back the optimistic data when the response is received from the backend with the same ID. Because we fetch our messages in reverse chronological order (oldest to newest) on the backend, we use the current date as part of our ID (which is used as a key in our DynamoDB table). We add UUIDv4 to the ID to ensure uniqueness. Our mutation defines what fields are returned when the mutation is successfully executed. To take advantage of the offline capability, we provide an optimistic response in our mutation that represents what the response from the server should look like. In our case, this is just a response object with the message. The app provides visual cues to let the user know if a message still needs to be sent, or if it’s been received by the backend. The message object that’s sent in the mutation has an isSent flag set to false. The flag controls the color of a check mark that’s shown for each message. When our mutation is handled successfully on the backend, a matching message object is returned with the flag set to true. This change in value automatically switches the check mark color from gray to green. ChatQL collects user session metrics. It also tracks the number of conversations that were created and messages that were sent in Amazon Pinpoint. You can do this by using AWS Amplify, which is also being used to implement authentication. We configure AWS Amplify once in app.module.ts, and call Analytics.record any time a message is sent after a conversation is created. 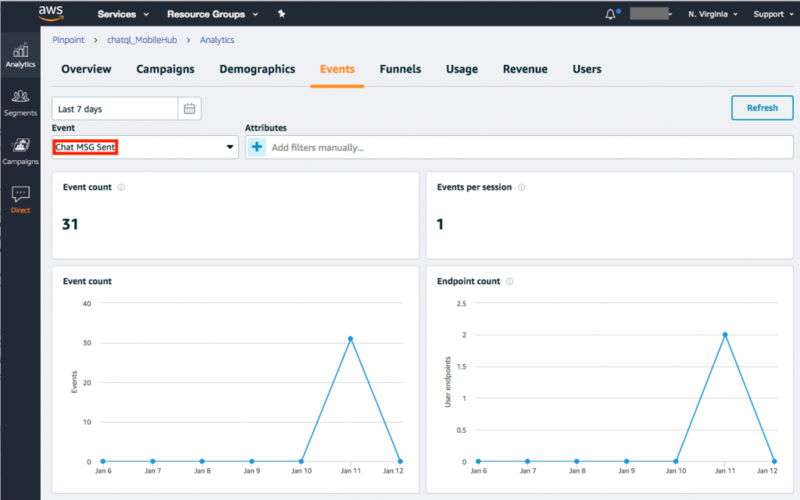 You can see the aggregated metrics in the Amazon Pinpoint console. We described how our app interacts with messages (querying, fetching, creating, subscribing to), and how we used optimistic responses to provide a seamless, improved experience to the user. There are also other parts of the app that interact with other parts of our backend data sources with AWS AppSync. We encourage you to dive in as well by getting started with the code, the documentation, and the AWS resources that are configured and deployed in the backend. We hope that this starter application helps you get started with AWS AppSync. You can find the code and information about how to publish the app in the GitHub repo. This post was contributed by Ed Lima and Brice Pelle. Ed is a Solutions Architect passionate about Serverless, Mobile, IoT as well as helping well architect AWS customers journey in the cloud. Brice is a Enterprise Support Lead and mobile support specialist. Brice also likes to tinker with app development in his spare time.